Years ago, Mr. K and I were introduced to Roar wines at Benu Restaurant when the sommelier recommended a bottle of their Pinot Noir; rounded, velvety and utterly delicious. We’ve been fans ever since and I signed up to their mailing list in order to have access to their limited production wines which sell out very quickly. 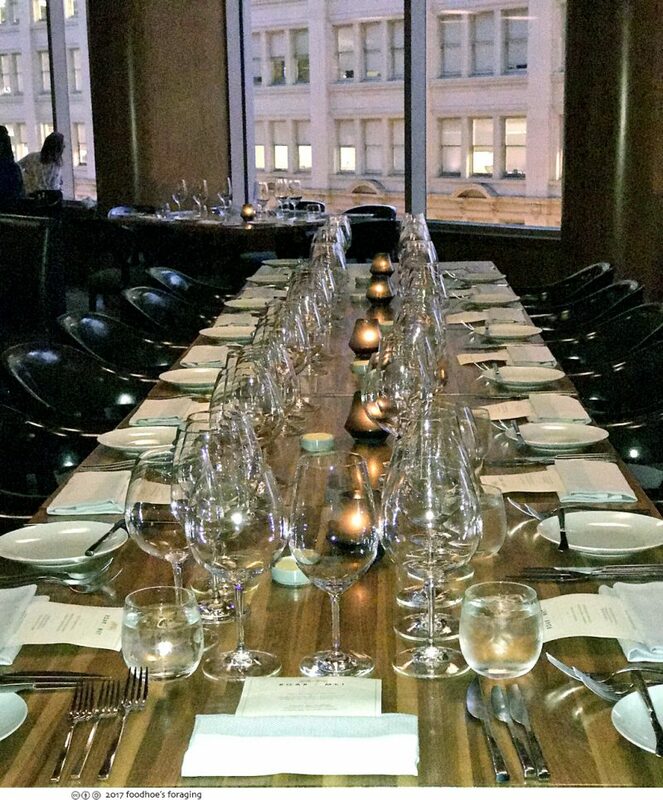 We recently went to a winemakers dinner with Roar Wines at Mkt restaurant and bar in the posh and swanky Four Seasons hotel with panoramic views of Market Street and downtown. It was a surprisingly cozy and intimate affair with a single table set apart in the middle of the restaurant which we shared with Adam Franscioni whose family has owned and farmed the vineyard for three generations. The winemaker Scott Shapley sat next to Mr. K so we were treated to many interesting anecdotes about life as a winemaker, something we know nothing about! The name “ROAR” is derived from the sound of the strong winds that blow through the Santa Lucia Highlands from the Monterey Bay and the winery is a family winery specializing in small lots of Pinot Noir, Syrah and Chardonnay. 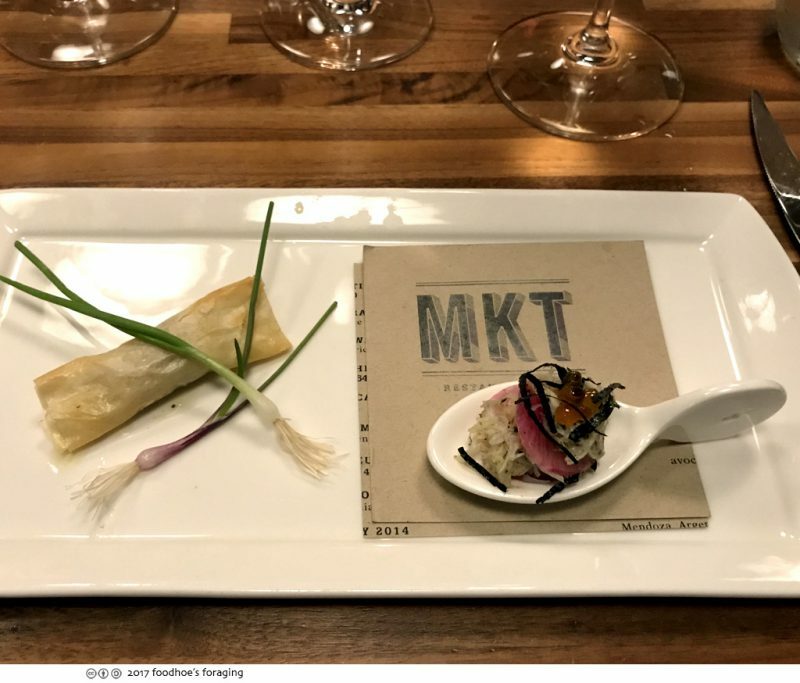 The dishes were served at the table by the chef de cuisine Esteban Soria, who grew up in wine country and has experience cooking with some of the world’s most acclaimed chefs, from Chef Masaharu Morimoto to Chef Michael Chiarello. The first course had two components, a delectable package of crisp flaky pastry dough with a rich and savory foie gras filling garnished with tiny spring onions, and the other bite served in a spoon, a mound of Dungeness crab topped with salmon roe, toasted seaweed and pickled mooli, which is a type of winter radish. Served with ’15 Sierra Mar Vineyard Chardonnay. The next dish was beautifully presented with two shells sealed closed with pastry dough that was easily opened by sliding our butter knives around the perimeter. 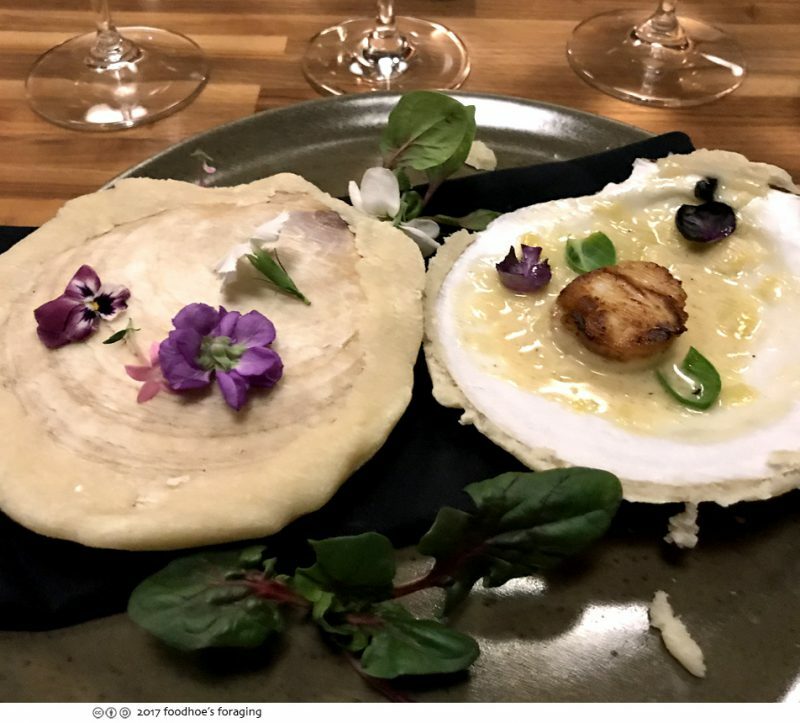 Inside was a delectable dish of Pacific Sea Scallops with leek fondue and Tahitian vanilla served with ’15 Sierra Mar Vineyard Viognier, a full-bodied wine full of texture and richness, lively and fresh. The next plate, California Artisanal Cheese course was a veritable feast: a pungent Gorgonzola with Marcona almonds, aged gruyere with honey comb and fried sage, fresh berries and cherries with slivers of candied orange peel, a delectably sticky piece of membrillo quince paste, a rich goat cheese called Humboldt Fog topped with cherries soaked in port, and a wedge of Brillat-Savarin triple cream, served with ’15 Pisoni Vineyard Pinot Noir which was full bodied and supple. Mmmm, so decadent and rich and fun to explore the many delicious combinations. 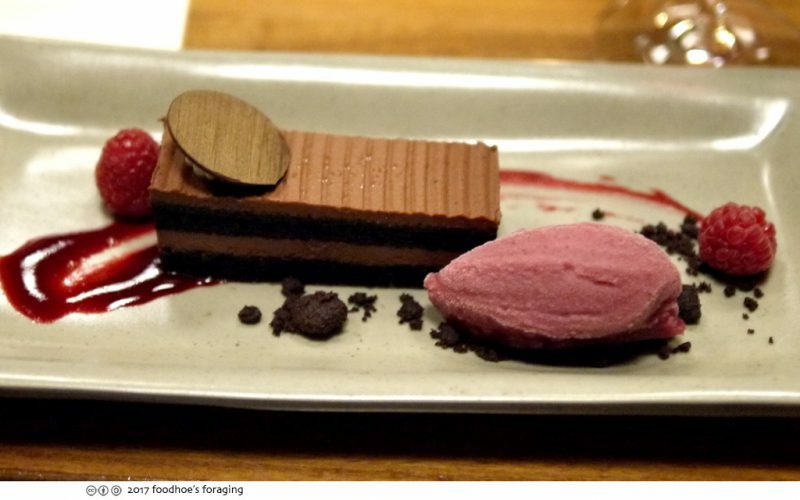 Dessert was a Dark Valrhona Chocolate Cake with mulled wine granita, served with ’15 Rosella’s Vineyard Syrah. I was so full that I could only eat the raspberries and granita! The syrah was so lovely with bold red fruit flavors with some black pepper and other spices, a high point of the meal. 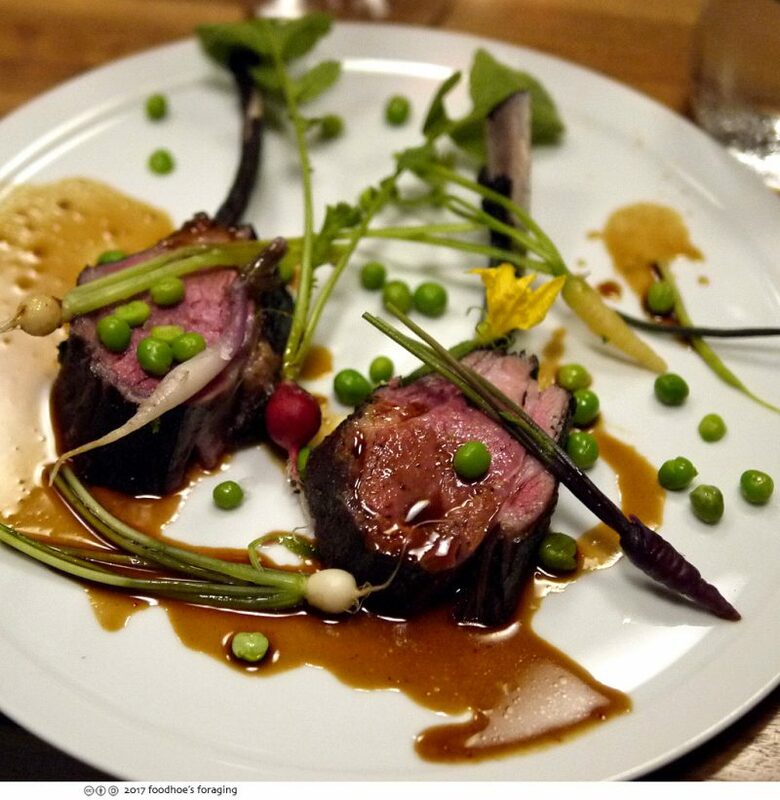 It was a great meal with fantastic pours in a beautiful setting with interesting dining companions and we really loved the price ($100 per person) which included everything, even the gratuity. What a dinner! That cheese plate is just stunning and artfully arranged. Tiffany, it was magnificent! 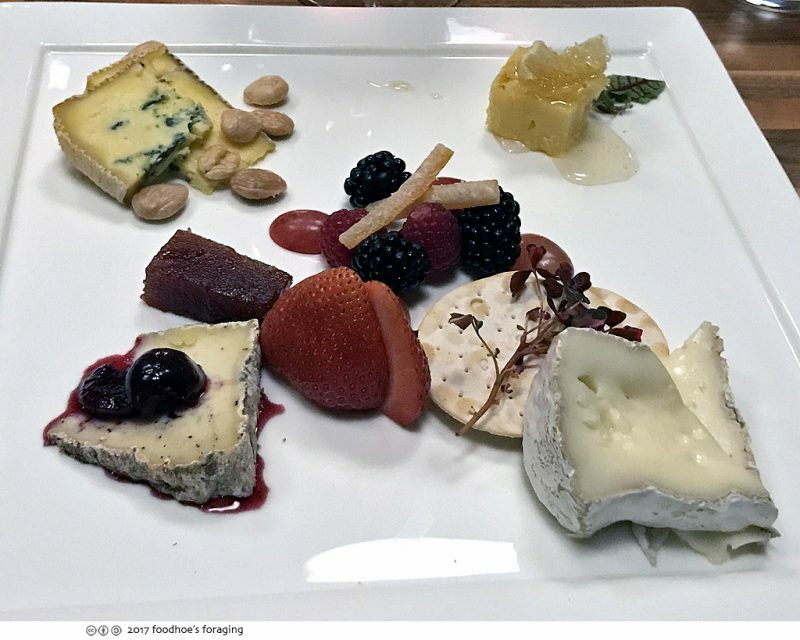 I could have dined on the cheese plate (and wine) alone!